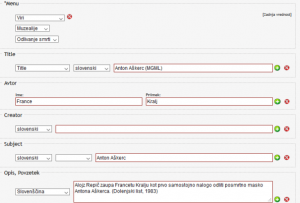 This post is written by Katja Meden who discusses how metadata is used in SIstory, an information system concerning Slovenian history. Ever since the beginning of my studies, metadata, metadata standards and semantic web were all topics that I have been very interested in, so much so, that my degree was based on those same topics. In this blog, I would like to present that very same degree (titled Implementation of Metadata in SIstory.si) in hopes that maybe you’ll find it interesting. I was researching the way metadata is implemented in the information system SIstory. SIstory (Zgodovina Slovenije – History of Slovenia) is an information system of Slovenian histography, part of Institute for Contemporary History and could be considered a system with a highly structured data. As a part of a new version of SIstory.si or rather SIstory 3.0, we developed a new way in which metadata is presented in the system – we developed our own application profile. According to Zeng and Qin (2008), application profile is a metadata profile that uses elements of multiple metadata standards and combines them together to create a new set of metadata element that can be used for describing more specific resources. SIstory application profile (SIstory AP) uses metadata elements from qualified DCTERMS (expanded, version of Dublin Core that adds new elements) and combines them with HOPE application profile (Heritage of People’s Europe), that “presents the heritage of the people of Europe and their history in the process of social change”(HOPE, 2011). This process took place with an intention to improve and make more rich metadata descriptions of the resources. To unify the naming of metadata, we decided to implement a crosswalk between said application profile and DCTERMS. A crossover is “a mapping of the elements, semantics, and syntax from one metadata scheme to those of another”. (Chan, Lei, 2006). Additionally, this provided the necessary tools to start developing on the RDFa part of metadata description. The part that reflects the AP and crosswalk implementation is mostly seen in the “ tag that describes the technique used to make the object. It is a tag that was originaly in the HOPE AP, but mixed with the DCTERMS to exist in SIstory AP. 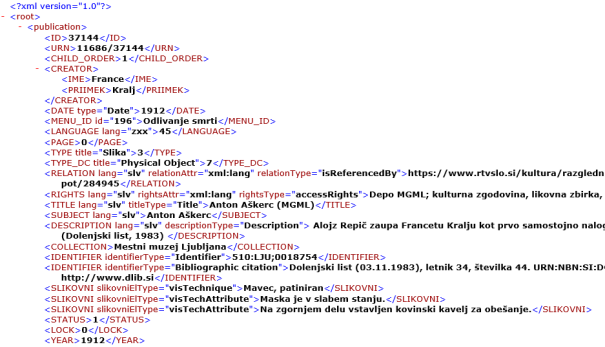 The second picture shows the same part as seen in the XML with the “ tag, but implemented in administrative system. The element presented is clearly marked with the namespace “dcterms” and named “dcterms:type” even though in the last two levels it was marked as “””. This is because, to secure simplicity in naming and at the same time unify it, we decided to “translate” the tag into the dcterms namespace. So the value still reflects the original tag name, but with a different naming. I concluded that this was certainly a progress and quite a feat for an institution of that size, especially on the part of involving semantic web and RDFa (since many of the institutions in Slovenia are not ready or willing to expand on the area of metadata). But what started as a project to expand the metadata schema for a better user experience got a bit carried away and shifted to the more technology oriented development. 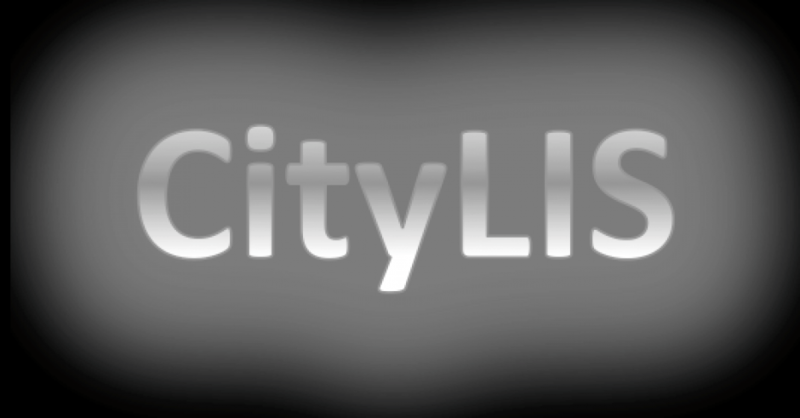 After a year or two of using this application profile, a new project is on the way – SIstory 4.0 – that will feature a new administrative system with a new metadata scheme – METS, for the fact like before, this is a way of upgrading our service. 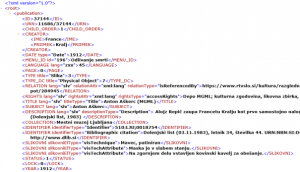 Right now, it is still in the stage of transforming XML data files with XSLT language to METS metadata schema. I do believe this is a step in right direction and that the result will be a lot more user friendly. And because METS schema allows TEI headers, it will contribute in developing this metadata element set with semantic web in mind and thus allow more open communication of our metadata. 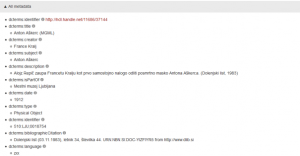 This entry was posted in Student Perspectives and tagged CityLIS, History, Library and Information Science, metadata, Semantic Web, SIstory.si, Slovenia, Student Perspectives. Bookmark the permalink.